The Mother of Modern Medicine by Kadir Nelson, oil on linen, 2017. 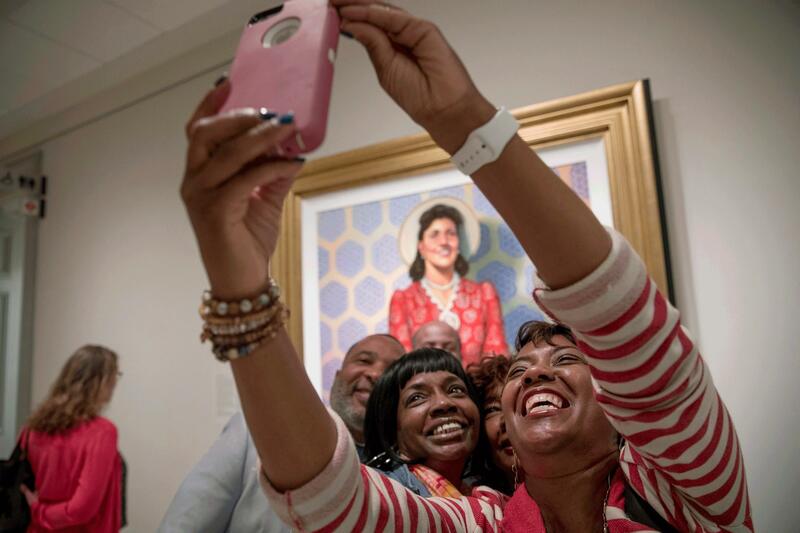 Relatives of Henrietta Lacks were on hand when her portrait went on display at the Smithsonian's National Portrait Gallery in Washington, D.C. Granddaughters Jeri Lacks-Whye (right) and Kimberly Lacks (center) pose with other direct descendants for a selfie in front of the portrait. "This is amazing!" marveled Kimberly Lacks. "Soon as you walk through the doors, there she is!" Kimberly Lacks, Jeri Lacks-Whye and Alfred Carter Lacks saw this portrait for the first time at its unveiling. They never knew their grandmother, as she died before they were born. "A beautiful woman," Kimberly observed quietly, studying the life-size portrait. "Just like they said she was in life," Jeri added. "Happy, outgoing, giving — and she's still giving." Literally tons of Lacks' cells have been grown in labs over the past 67 years. They helped develop the AIDS cocktail, the polio vaccine and treatments for hemophilia, herpes, influenza and leukemia. 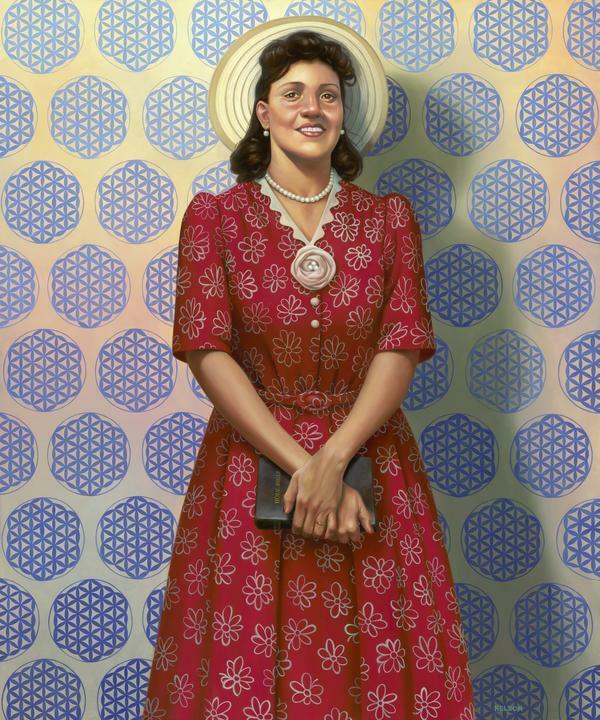 Henrietta Lacks and her family never benefited from the thousands of patents and billions of dollars her cells helped generate. HBO commissioned this painting after the company made a movie based on the award-winning nonfiction book The Immortal Life of Henrietta Lacks by Rebecca Skloot. The canvas is co-owned by the National Portrait Gallery and the National Museum of African American History and Culture. Bill Pretzer, a senior curator at the African-American museum, says the story of Lacks is also one of racial history, bioethics and medical history. "Doctors had been trying for half a century to grow cells in laboratory circumstances that would reproduce," Pretzer said. Lacks' cells did. What's become known as her "immortal line" is represented in the painting, said Pretzer, by a pattern in her cheerful red dress that resembles cell structures when you look at it closely. "There are a couple of buttons that are missing on Henrietta Lacks' dress, and those were explicitly left off by the artist as a symbol of the cells that had been removed from her body," he said. The artist, Kadir Nelson, painted Lacks standing in front of a wall covered with blue and purple hexagons. "A pattern that almost looks like wallpaper, but it's actually representative of her cells," said Dorothy Moss, a National Portrait Gallery curator. In the painting, Lacks clasps a Bible in front of the part of her body from which her cells were taken. Her face is haloed like a saint's by the brim of a light sun hat. The doctor who cut her open wrote later that the tumors looked like pearls studding the inside of her body; she wears pearls in the portrait. Her granddaughter Kimberly has her own interpretation. "Pearls seem like its classy, just a test of time — and that's what she was, she was classy," Kimberly said. "I just think it's amazing. A great representation of our grandmother — our 'she-ro.' "
Pretzer said this portrait should be a reminder "that history can be remade, re-remembered." Along with the painting, Lacks has been re-remembered in all kinds of ways in recent years: She received a posthumous doctorate in public service from a college in Maryland. A high school for students interested in medicine now bears her name. So does a minor planet whirling in the asteroid belt between Mars and Jupiter. 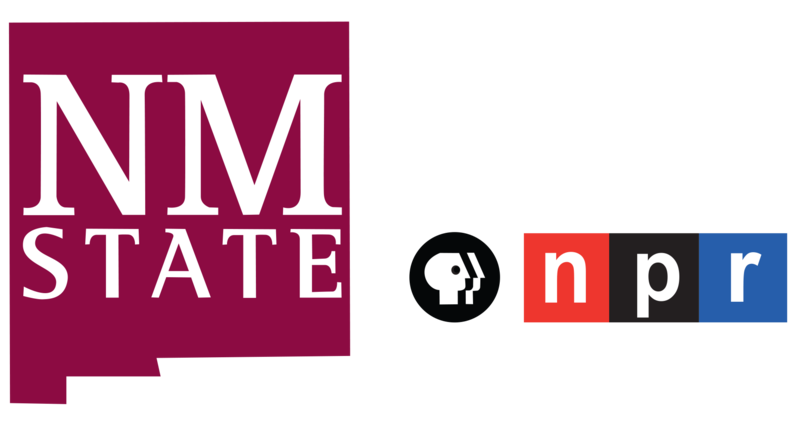 [POST-BROADCAST CORRECTION: In the audio of this story, as in a previous web version, we give Jeri Lacks-Whye's last name as Whyte.] Transcript provided by NPR, Copyright NPR.